When we speak of the seven sacraments worth noting is that only one of the seven sacraments is plural. That sacrament is Holy Orders. What are the three levels of orders? Deacons are men ordained by the bishop to serve. Deacons in the Latin Church may baptize, read the Gospel, preach the homily, assist the bishop or priest in the celebration of the Eucharist, assist at marriages, and preside at funerals (outside the context of Mass). Priests “are united with the bishops in the priestly dignity and at the same time depend on them in the exercise of their pastoral functions; they are called to be the bishops’ prudent co-workers” (Catechism of the Catholic Church, number 1595). Priests serve God’s people in the work of sanctification by their preaching, teaching, and offering the Sacraments, especially the Eucharist and the forgiving of sins. Bishops are normally ordained to teach, to sanctify and to govern a diocese or local church; a bishop is a successor of the Apostles. 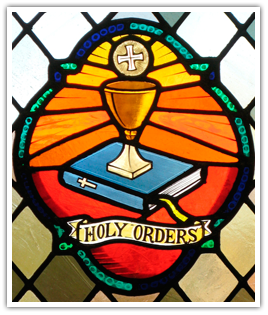 The office of episcopacy (bishop) is the highest of the three levels of Holy Orders. If anyone is considering a vocation as Permanent Deacon or Priesthood, please contact one of the priests at Resurrection Catholic Church.